The famous Black Bull pub on Leith Street, opposite the current building site that was St James’ Hotel and shopping centre. I’ve lived in both the East and West of Edinburgh and when I stayed in Pilrig Street just off Leith Walk this was a daily sight as I made my way from Leith Walk to Princes Street. Many of you will recognise this basement bar and entrance steps from the Trainspotting opening credits as Renton runs through the city streets. Not much has changed on the exterior, apart from the lettering now on the railings. 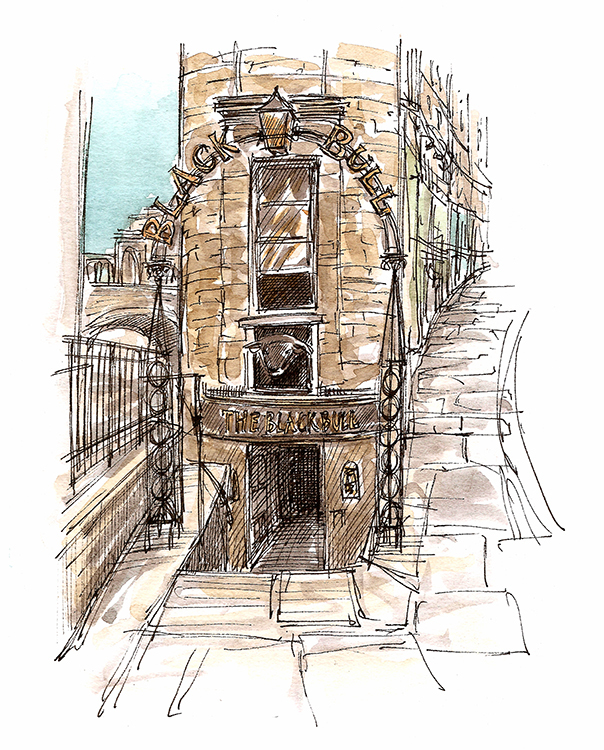 The bar is an iconic Edinburgh location so I am glad to finally capture it in ink and watercolour. This original piece was made for a commission but mounted prints are available for £18 (100x150mm) or £32 (210x290mm) from the shop link below. Also if you would like to commission your own piece of Edinburgh Sketcher art then email me HERE, prices start at £65. Black Bull prints to buy.